As I mentioned in my previous post, we went to the mountains last weekend and had a fabulous time doing mountain stuff like hiking, visiting friends, eating delicious food, and relaxing! Something about being there always makes me feel like I've come home. 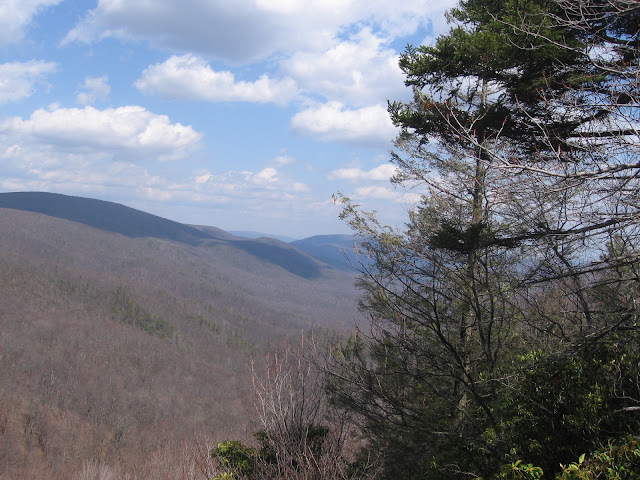 Perhaps it's because my family's roots are in the Allegheny mountains and some of my best childhood memories are from there, or maybe it's just the incredible beauty that seems to be around every bend in the road. Whatever the reason, I love to go and cherish the hope that one day we'll be able to make the mountains our home in reality. Who wouldn't love a vista like this? 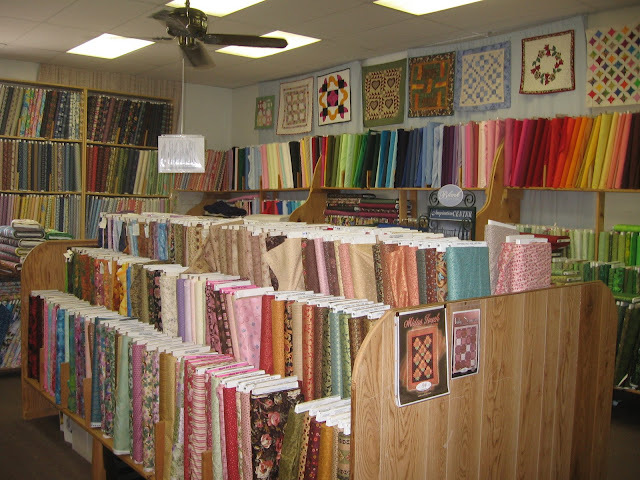 Located in the lovely, artsy, and tiny town of Floyd, VA is the most amazing fabric shop. It's called Schoolhouse Fabrics and is 3 floors and two buildings of an old schoolhouse, hence the name, that have been transformed into an incredible fabric heaven. It's almost overwhelming for a fiber addict like myself, but at the same time ...nirvana! 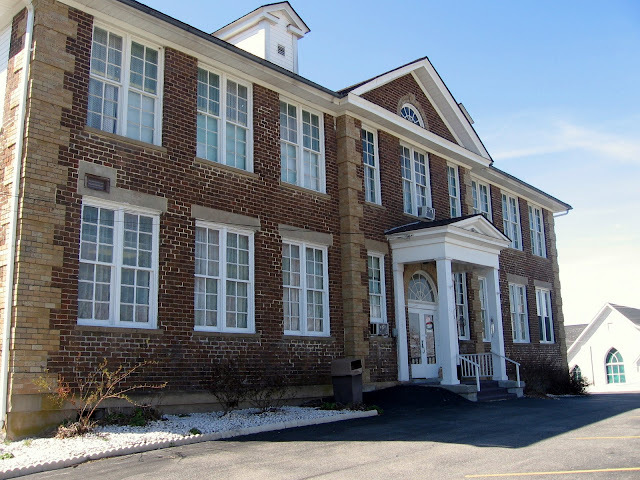 This is a picture of the outside of the building so you can see just how huge it is. Here's a picture of my haul from this trip. 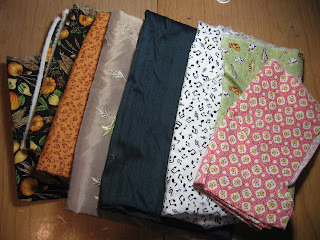 I was very good and only made a few impulse buys...that dark green silk duponi was a remnant I couldn't refuse and is so much more gorgeous than the picture...and can you see a fall harvest fairy in those fabrics on the left? Nothing like a stash of new supplies to make you want to get right to work, so perhaps I should go do just that! I really don't sew other than a few ornaments, but I too would love a huge fabric store like that. The colors and textures are always so tempting- so many possibilities. Will you use these for dolls or do you make other fiber art? Thanks Kirsten and Birdie! I do knit and crochet but most of my fiber art is doll stuff. The great thing about making dolls is that you get to use so many different types of crafting techniques to make them...everything from basic sewing and other needlearts to getting down and dirty with clay or(best big mess maker) Paper mache! Sounds like a fabulous vacation! I can't wait to see the goodies that come from your latest fabric foray. ps.. I love love love love love my fairy! She is sitting on my mantle gossiping with the other fairies hanging around in my living room. That view is to die for. Seriously, if i had a view like that from my window i would get even less work done! The shop looks fantastic but i'm glad i did'nt visit, i would just spend and spend and spend.......it sounds as though you had a good time though. Where the heck have I been this week? Oh yeah, Spring Break Hell, that's where! Glad you had a great trip up to Floyd - with such a groovy fabric store, no wonder its such a draw! :P I can't wait to see what new inspirations you get from the fresh fabs! You time in the mountains sounds so refreshing and relaxing! I love old buildings that find a new life like that and even though I can just about sew a button, it really does look beautiful in there!